Well, as they say, “It’s show time!” The uniqueness of our sport, when performed at the higher levels, is that each ride appears the same. The degree of separation between horse and rider is so small that it is very easy to become bored when combination (horse and rider) after combination show little difference. 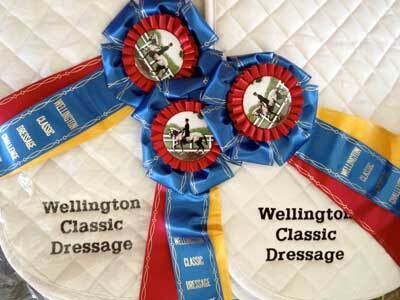 For us as competitors, this is about showing the judge how well you have trained and prepared your horse. The excitement can be either a flawless, harmonious test or an opposite one, laced with a disobedient or fearful horse. For my girls, we experienced all of it and the scores reflected that. Example: I’m riding my best test, the scores were high, and at the open end of the arena at “A” my horse spooks and steps outside the ring. 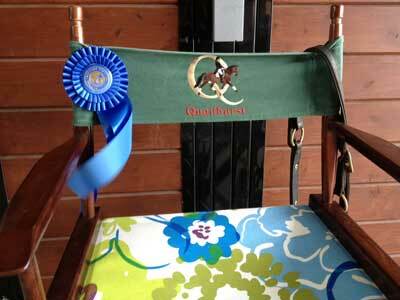 We finished the test, but had to be disqualified for placing a foot outside the arena. Our travel began in Orlando, driving an easy 3 hours south to Wellington and the most magnificent show parks in our country. With countless equine transports hauling to shows, the freeways look much like a school of fish swimming downstream and on Sundays, at the conclusion of the event, the reverse. The roads are flat, straight, groomed like a show ring, and allow high speed driving with ease. 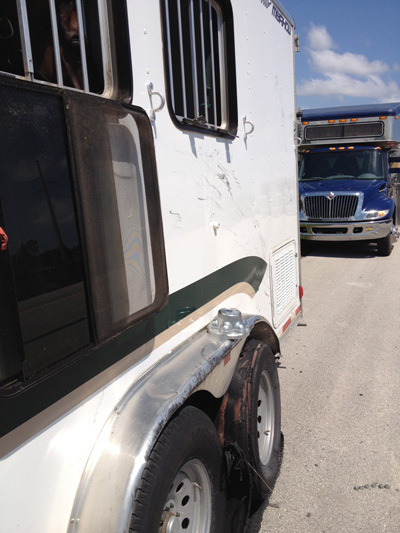 Hauling our equine friends can be the most stressful segment of our showing and, even with all of the luxuries Florida has to offer, sometimes things just happen. Like my friend who was traveling ahead of me with her horses. She blew a tire on her horse trailer. The tire shredded the outer layer, flew up and hit the window that was latched down below the horses head, and tore the window completely off the side of her trailer. It flew up and onto the busy freeway and I was navigating around to not run over it! We all pulled over, the tire was repaired in minutes, and off we went as if nothing happened. Upon arrival to the show grounds you are always greeted by someone who has all of your information and personally guides you to your stalls. Unloading is never stressful because there is adequate space for everyone and the layouts are intelligently designed. We showed at a variety of locations, all of equal design and well organized, but my favorite was Global. The permanent stabling was nicer than 95% of all barns in our country, offering every amenity you can dream of. The grounds were Big and Bold and, with all of the constant activity and volume of horses, my girls happily moved right in. There is only one thing that mixes it up… the unpredictable weather. It was gorgeous one second and a deluge the next. Example: woman from Oregon riding in the first class of the day on a young horse and halfway thru their test it begins to rain. (A chance of severe thunder and lightning had been forecasted. A chance.) Then the sky lights up with repeated flashes and sirens begin to blare. The horse seems fine with all this and the rider is so focused she notices nothing, only hearing the noise she is unfamiliar with. The pair continue their test and at the halt and salute are told to immediately return to the stabling area until the storm passes. When I, the woman from Oregon who knows nothing about the sirens, looked up there wasn’t a horse or rider in sight and the sky was black! Moments later they stopped the show for 3 hours. 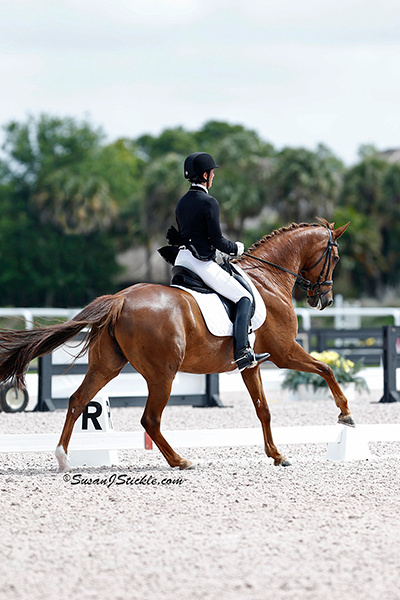 Showing in Florida is addictive. The scoring is the way it should be – tough. The riders and level of competition – relentless. I loved it. 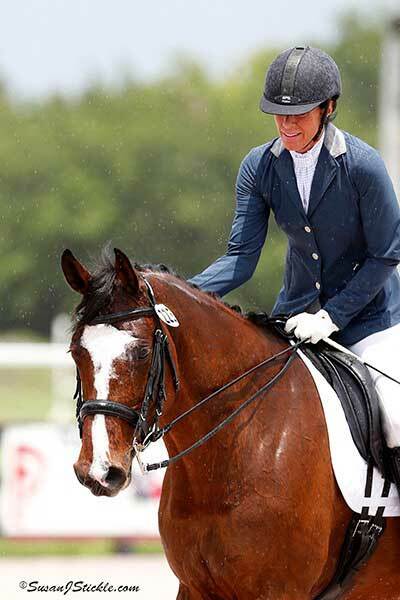 To me, it was the Real World of dressage in America and the only honest way to find out where you stand outside of traveling to Europe. For me and for the girls it was a huge success, as both mares are complete opposite rides. I had to really bring my A game and focus, as Anne would say, because this was not easy. But, once again, Anne chose the right strategy and preparation that provided success. How do you ever thank someone for sharing knowledge and committing themselves to your success? Our country was more than fortunate to have her as our US Team leader. The final journal will be next week. We will include a photo montage of Deborah’s personal photos during her winter experience. Read the full training journal here.